#21. Greenland – Mediterranean. – Sampson Boat Co.
After our long and epic cruise in Greenland, our Guests and the owner of the boat flew out of the country on various planes, and we were back to a crew of four. 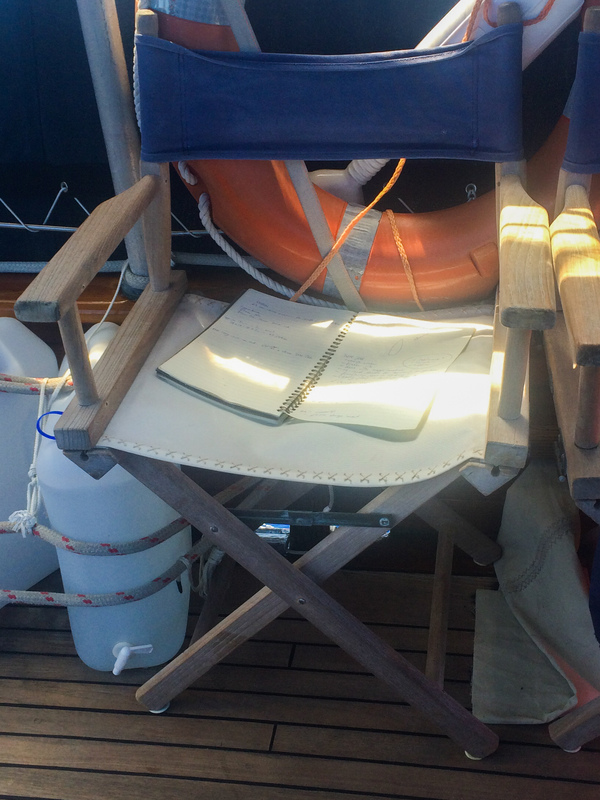 We needed a few more for our Atlantic crossing, so I flew in a first mate from Austria, and we put up a couple of notices for recruiting locals. We later found out that our notes seeking crew were put online and went somewhat viral in the Greenlandic Facebook community. 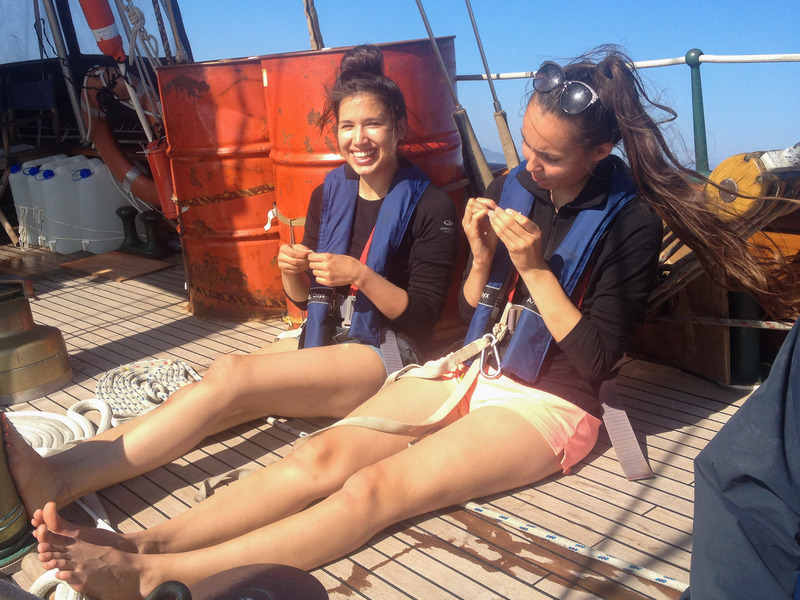 We had a few applicants but decided to take with us Ina, Line and Palo, three young and adventurous locals of Inuit descent. We had a visit from some of their parents, who came to check us out, and inexplicably decided that we seemed responsible enough to take their children across the North Atlantic. However, they did insist on taking photos of our passports, just in case we turned out to be in the people trafficking business, in which case we were promised ’Taken’ style retribution. Crew sorted, we took on inordinate amounts of food and water, gas and diesel, spares and parts, and headed out of Nuuk, on a day trip south to Pamuit to give the new crew a chance to jump ship if they decided that we were all lunatics after all, and to give us a chance to chuck them off if we felt the same about them. Pamuit is famous for being exceptionally foggy, and it lived up to its reputation. It is affectionately known as the ‘armpit of Greenland’, but we actually found it quite pleasant, apart from the complete lack of visibility. Our new crew proved to be very handy when a fishing boat moored alongside us full of snow-crabs – after a little local banter, we were given a crate-full of the unearthly creatures, still crawling around. 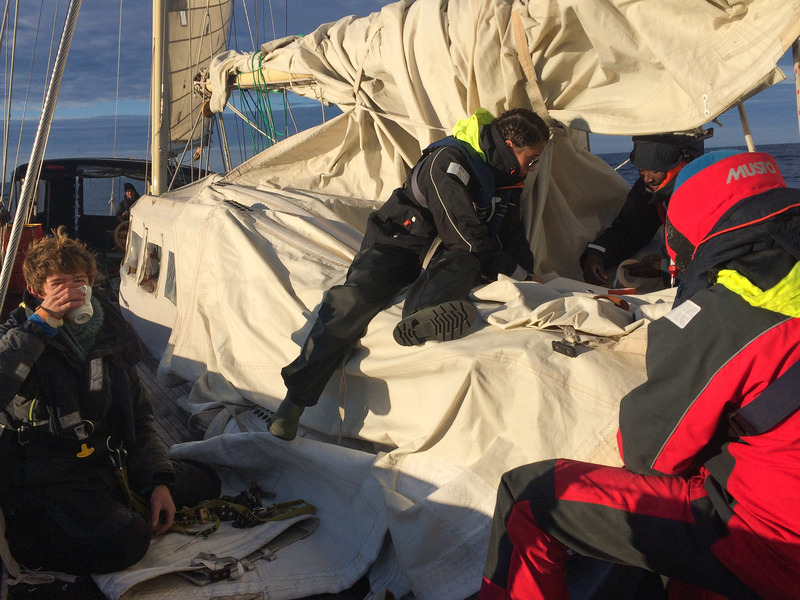 After an opulent dinner on board, and a last night sleeping on a stable flat boat, we did some final rig and hull checks, and slipped our lines. The first couple of days were foggy and rainy, but at least we had some wind, which was more than we expected. Our last sight of land for three weeks was very undramatic – just a dull shadow blending into the rest of the greyness. I arranged the watch rota and all the various maintenance and cleaning checklists, and we gradually settled into our routine. After a few days we settled on having a daily meeting at noon with all eight of us on deck, where I told everyone about the latest navigational decisions and the weather forecast (which I received via satphone), we picked volunteers for cooking lunch and supper, and I assigned any jobs for the day which didn’t appear on the daily job checklist. This system worked very well, especially with the cooking. It meant that time in the galley was shared, but those who liked to cook more than others naturally volunteered to do more meals. Only occasionally did I have to encourage people to volunteer to cook with the baseball bat that I kept by the helm for the purpose. The vegetables were rotated every morning and anything nearing the end of its life was given to the galley. By doing this we managed to keep some of our fresh vegetables for the entire three weeks, although by the end of it we were extremely bored of cabbage. We ate two hot meals every day, and breakfast was just a matter of helping yourself to muesli or leftovers from the night before. 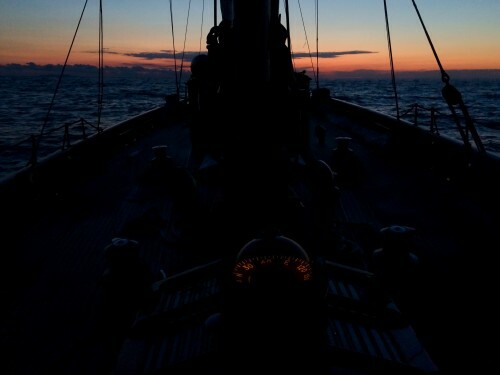 We had four three-hour watches of two people, which added up nicely to fit into twelve, and also meant that everybody time for a good sleep most nights, although of course there were plenty of times when we all had to be working on deck, regardless of watches. A few days into the trip, we found out that a low pressure system which was meant to pass South of us was going to travel much further North than previously forecast. To avoid it, we had to turn around and head back the way we had come from. It was a little disheartening to lose so much ground, especially as we had been making great speed, but the only other option was to go straight through what had become a very strong storm. A day or two later we were able to turn southeast again and make back the ground we had lost. 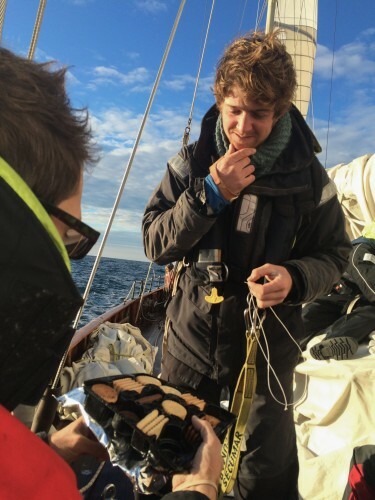 We picked up some good wind from the tail end of the storm, and made a steady ten knots for some time. 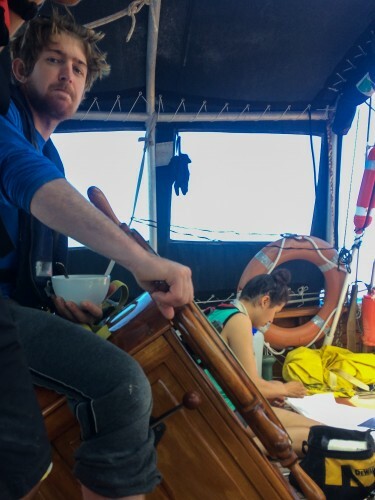 Sincerity was as frustrated as we were about losing two full days of sailing, and was determined to make up for it by showing us her best speed, and so we crashed along through the huge swell as if it was not even there, broad-reaching our way towards warmer water and home. Unfortunately our sails were old and unhappy, and it was just a matter of time before they started ripping. And sure enough, one gusty night, the main tore whilst putting a reef in. 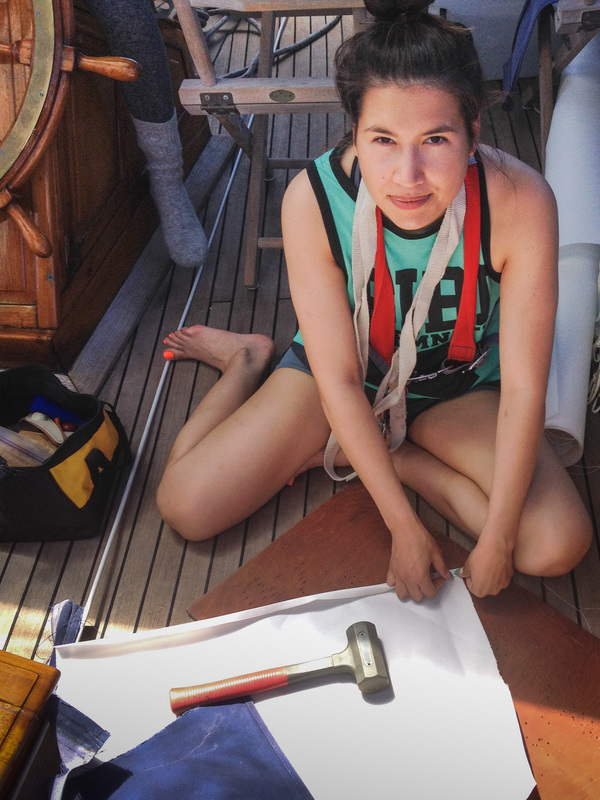 We dropped the whole sail onto the deck and patched it up by hand, sailing under mizzen and foresails alone. 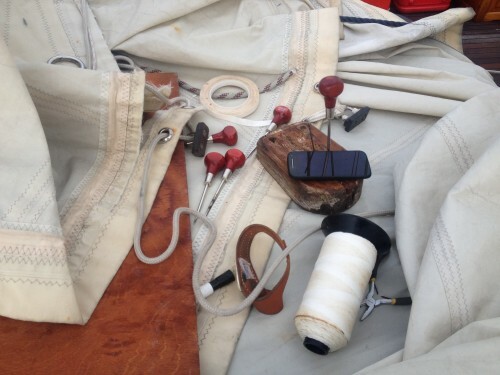 It takes a lot of man-hours to sew through thick sailcloth, but we all took turns working on it, and by morning it was finished and hoisted again. 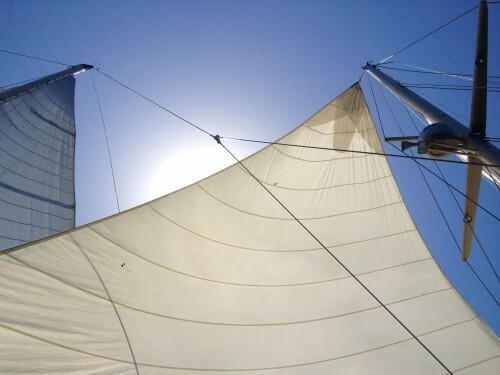 Unbelievably, the same thing happened the next night, although in a different part of the sail. When I came up for watch at midnight and saw the torn fabric, I couldn’t put my frustration into words, and so we silently took the whole thing down again, and spent another sleepless night stitching it up. By the time it had ripped a third night in a row, we were able do the whole operation in about half the original time, although there was considerably more cursing involved. And this time, we took the main right off the boom, and bent on our spare (older) main instead, which looked shabbier but was made of a thicker fabric. It is a challenge to get it set up, because it is about twice the weight of the other main, and takes four people to move, even when it is folded neatly. 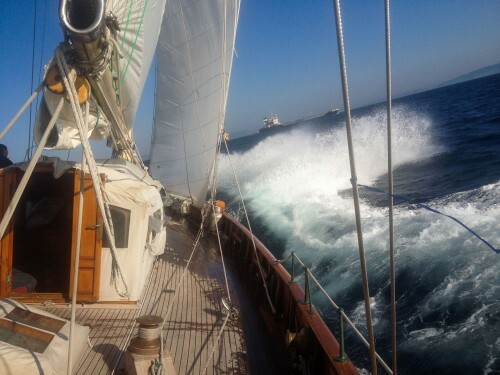 However, it served us well through some bad weather and didn’t need any more attention for the rest of the passage. 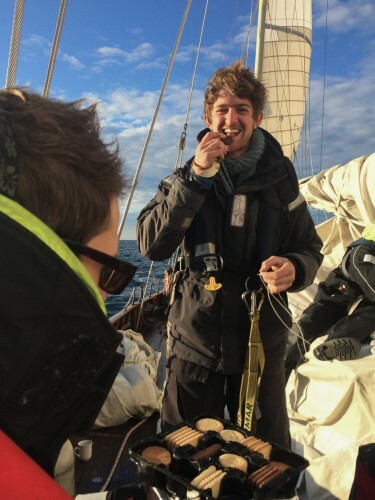 Having sailed my first transatlantic solo earlier in the year, the experience of doing one with a big group of people was, obviously, very different indeed. 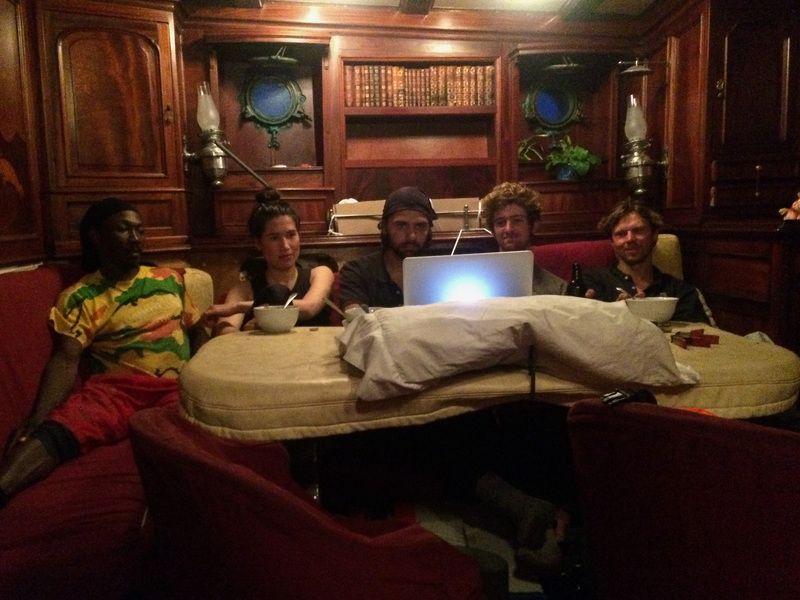 I really enjoyed having company, and being part of a larger group also means that you are not forced to spend too much time with any one person, which can of course get tiresome on a smaller boat. 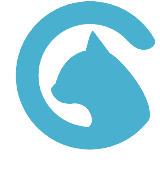 However, there are also things lost in company – I spent less time daydreaming and philosophising, and more time working on rotas and management. With more technology on board than my previous trip, I spent less time looking through a sextant, and more time using the satphone, trying to decipher dyslexic Norwegian weather reports and relaying our position to various worried family members and owners. Although this journey was challenging, it was challenging in a very different way to my previous trip. 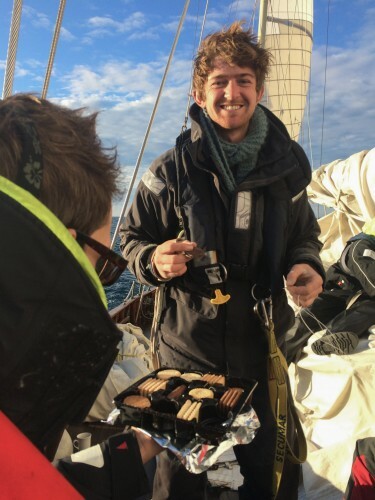 There was one issue that kept recurring, and took up a lot of my energy and time as captain – When we were provisioning in Nuuk, Jake had taken great pains to ensure that we had enough biscuits for all of us for the whole trip, which meant 50 big selection packs. The trouble was that about half the biscuits in each pack were interesting ones, and the other half were all boring shortbreads. This meant that as soon as a pack was opened, there was a mad scrabble to get the best ones, and then the rest of the biscuits would hang around feeling lonely and waiting for someone to put them out of their misery. Sometimes they would sit near the helm until a stray wave rendered them inedible. Occasionally, someone would commit the atrocity of opening a new pack before the old one was finished, and the poor guys on the next watch were left with not just one, but two sets of shortbreads to eat before they could get onto the more exciting biscuits. This crime was punishable by keel-hauling (look it up if you don’t know), but there were never any witnesses, of course. Eating more than a fair share of shortbreads was rewarded with extra rum rations. I occasionally bought my guitar out on deck, and Phil, the first mate, turned out to be an excellent percussionist. The pepper grinder made a perfect shaker, and the water bottles strapped to the bulwarks provided the rest of the drum kit, as they changed in tone as we used more water from them. It took two weeks of south-east progress before we really felt the weather change, and then we had our first bit of sunshine and warm water. The wind stayed fair most of the time, and we watched the tiny speck that represented our boat inch slowly closer to Europe. As we finally approached the straits of Gibraltar, we started seeing more and more shipping and marine traffic, until eventually the AIS was jam-packed with boats coming in and out of the narrow channel. The wind turned to the East as we came closer to the straits, and our timing meant that we also had the tide against us, and so we found ourselves beating into 20knots with full sail up to keep a good speed. 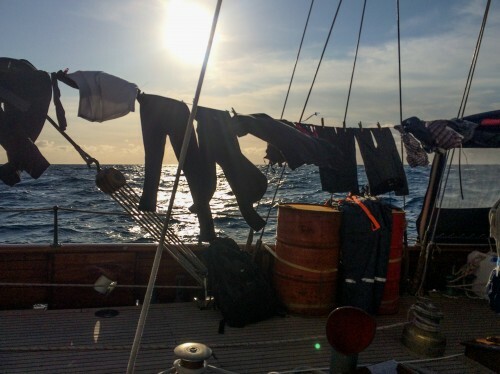 We had to avoid dozens of fast-moving ships on each tack, but it was a beautiful evening and it was amazing to be tacking between Europe and Africa, getting within just a mile or two off the Moroccan coast each time before going about. We eventually pulled into Tarifa in the middle of the night, moored up in the harbor, and stepped triumphantly ashore. I had arranged via satphone to pick up two of my old school friends in Tarifa, and they were waiting on the other side of the dock, waving frantically. 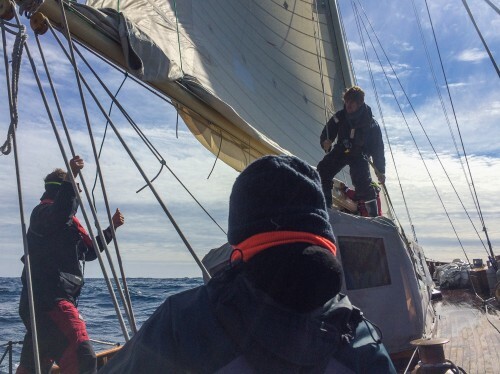 They joined us with much merriment and hugging in the car park, and then all ten of us trooped into the immigration building to try and explain where we had all come from and how such a troupe of miscreants came to be sailing a beautiful 27M classic yacht around. The armed immigration man listened carefully to our poor Spanish explanations, and then smiled broadly and asked us if he could come with us. We cast of as soon as possible, narrowly avoiding the very fast and scary ferry that comes from Morocco every half an hour. After three weeks at sea, we had only been ashore for about an hour, and we hadn’t even been to a bar. Some of the guys found a vending machine in the port but then realized that they only had enough loose Euros for a bottle of water, which was the only thing we still had plenty of on board. They bought it anyway, just for the novelty. Despite our short stop, we continued into the Mediterranean in high spirits – not least because our new crew had bought with them lots of tobacco and whisky and wine – cleverly ensuring that they were warmly welcomed into an established crew.